Often, fishermen disregard the food value of unusual fish. The Atlantic Sharpnose Shark is one of the most common sharks up and down the East Coast. They don’t grow very big. Three feet long is about the average size for these unusually small sharks. Many of the larger species of sharks are prohibited for harvest due to their protected status. Without fishery management regulations to conserve shark populations that have been diminishing, there might be very few of these toothy predators left. There is a daily limit of one Atlantic Sharpnose Shark and that is certainly enough to provide a few delicious meals. 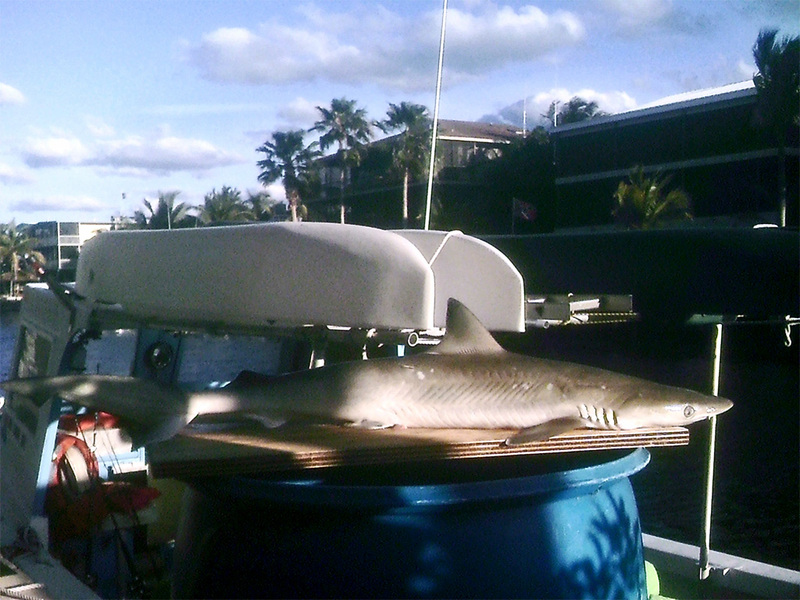 The shark in the photo was caught while fishing for bottom fish in fairly deep water (135 feet depth). Sharks do not have kidneys to process urine. Thus, to make the meat taste good, the shark should be gutted and allowed to bleed out in the water. The trick is to grab the shark by the tail and point those snapping jaws away from you. Hold on tight. Hang the shark over the side of the boat and rip through the belly with a sharp knife. Spill the entrails out and suspend most of the shark in the ocean from a line tied around the base of the tail and secured to a cleat. About a half hour later, pack that almost dead shark in ice, carefully. Even dead sharks have been known to bite. I had to agree. With sensible preparation, these small sharks taste just like swordfish for a fraction of the cost to catch one of those monsters. Even the pelicans at the dock seem to especially like the shark guts and chunks of carcass thrown from my fish cleaning table. Most sharks are designated for catch and release, only. But, the Atlantic Sharpnose Shark that bites on my line will be caught and filleted. I have a hungry woman to feed. A few years ago I tried some fried shark; delicious. I really enjoy your posts Capn’ Larry, they are quite entertaining and informational. Most of the joy of fishing for me is to see people catch fish and then eat them properly prepared. Not only is this a happy and healthy experience, it is truly educational. Tonite, I’m pan frying tilefish fish cakes in olive oil. They taste like crab cakes with shrimp and lobster blended in. If you make it down to the Keys, call ahead & drop by my Mate’s Place (43 Garden Cove Dr. KL, Fl.). You won’t go away hungry or unhappy.